"...But The Truth Is Probably Just This..." COMICS! Sometimes We Weren't Worthy! Okay, okay. So I can’t keep that pace up. Back to the old as and when, I’m afraid. Stop cheering, already. Show a little class, huh. Sergio Ponchione. Steve Ditko. Jack Kirby. Wallace Wood. Well, this is an odd beast of a thing. It’s a comic, but it’s a comic about comic creators rather than their creations. It’s about them in the sense that it seeks to provide an enticing introduction to their work and convey some sense of the importance of their art. Rather than, you know, being a comic where Steve Ditko, Jack Kirby and Wallace Wood drive around in a van with a comedy dog solving eerie mysteries. Hmmm, or, wait, Steve Ditko could be a mysteriously commanding voice over the intercom like Charlie, and Woody and The King could be his Angels. There could be kidnapping, hairspray, glamour and fantastic jump suited action sequences suddenly halted by the two artistic giants crouching stiffly due to their smokers lungs concertina-ing with the effort of motion. Get my people to call Image’s people, people! STAT! No, thankfully, Sergio Ponchione has neglected such glibly hip kitsch nonsense and chosen instead to celebrate work of three men he clearly venerates. The comic (and it is just a comic rather than a book; it’s glossy, well designed and, odd stumbles in translation aside, really rather fine, but it’s still a comic) devotes an episode to each artist with a linking structure. Basically, then, it’s a portmanteau set-up but instead of Peter Cushing selling Ian Ogilvy a mirror haunted by David Warner we have a young cartoonist (gelled hair, earring) seeking the wisdom of the humble master of the comic arts, Sergio Ponchione (low maintenance ruggage, no ornamentation). 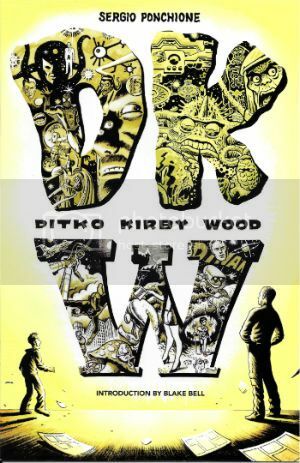 This wisdom largely consists of Ponchione telling the youth (a bit off-puttingly schoolmarmish in tone, actually) to study the masters of the past – Ditko, Kirby and Wood. Ponchione is clearly all about those guys and he delivers tribute to them not by replication but via evocation. He pulls off the nifty trick of presenting each artist’s stylistic hallmarks wrapped in his own soft and warming style. Ponchione delivers the nearest thing to a story with the Kirby section. This is appropriate enough because of the three men Kirby was certainly the most narratively driven. Ditko was/is often driven by pure mood/propagandistic fervour with little concern for the niceties of narrative. After a certain point I don’t know what Wallace Wood was all about but, uh, let’s just call it a lust for life. Of the three Kirby was The Storyteller Supreme, so he gets a story. All of this strip is delivered in a Kirby via Ponchione style and again you can tell who Ponchione’s doing but you can also tell it’s Ponchione doing it. Ponchione avoids the lifelessness of imitation by avoiding the easy route; he doesn’t fall back on the Kingly signifiers such as the pair of eyes diagonally bisecting the panel or someone leaping fist first and gravity last right out of the page. Instead every image seems to contain something from every Age of Kirby, yet also something of Ponchione. I think he misses a step by having Kirby find pleasure in his work and isolation. While Kirby would no doubt have bust his truss with joy if left to his own artistic devices he’d still want his family around, I think. Kirby’s different from Ditko and Wood in the very real, very genuine love of live which suffuses even his darkest work. As nuts as any family can drive you it’s probably due to Kirby’s refusal to commit entirely to his art at the expense of his that means his work always had Hope built in. Wallace Wood could have done with some of that Hope but instead he possessed a surfeit of anger, or it possessed him. Howard Victor Chaykin once described Wallace Wood as an “engine of rage”, and Howard Victor Chaykin knew the man and also, I imagine, whereof he spoke. Wood gets the illustrated essay treatment and thus far more factual information is delivered about him and his work here than either Kirby or Ditko. Being an artist Ponchione is good at telling us how good Wood was, but Ponchione is even better at teasing out the genius of Wood’s EC Mad work. This stuff is often underrated but Ponchione clearly and swiftly describes how its reliance on the visual as opposed to the “straight” EC stuff’s text heavy approach honed Wood’s work into a miraculous joy of chiaroscuro and visual onomatopoeia. A miraculous joy which reached its arguable and early peak with his work on The Spirit. Being an artist Ponchione dwells on Wood’s achievements while lightly acknowledging the torments and addictions which eventually undid him. Wallace Wood didn’t walk through the fire, instead it consumed him from within at its own deadly pace. Ponchione seems to want to cast Wood’s fall as due to his immersion in his work to the detriment of all else. Ponchione implies, I think, that after Wood’s early peak he burned out. Maybe, maybe that was the spur to the habits that killed him. Hmmm, such conjecture feels unseemly from such as I, so let’s just say that there are no answers here. But let us also note that there aren’t supposed to be. What there is here is a tribute to a wonderfully talented man. One which, understandably, concentrates on the talent rather than the man. 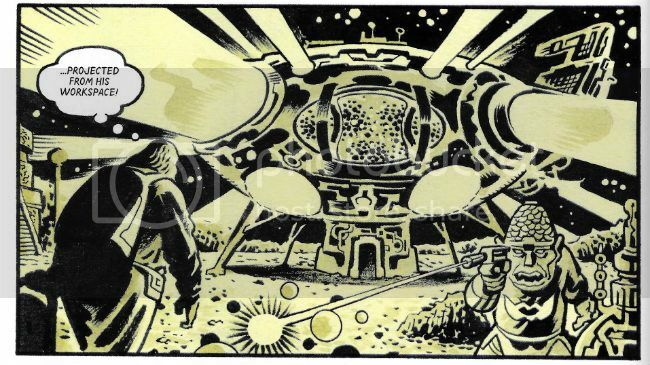 Wallace Wood; he was so, so very good. I like Ditko, Kirby and Wood and it turns out I like Ponchione’s art too so I enjoyed this comic just fine. But because I am a withered, loveless thing I do have a couple of beefs. Blake Bell’s introduction is a little too vinegar lipped for me and quickly falls into the trap of praising the Past by denigrating The Present. I know because it’s a trap I fall into so often myself that I’ve put a mattress and some bookshelves in down there. So I also know how easily done it is. Then there’s the product placement. Usually when it comes to product placement I’m with David Lynch, so I found it jarring here when in the strip Ponchione (or “Ponchione” if we must) has a panel in each strip hawking a book on each artist. In this instance I know it is sincerely and honestly intended as a spur to further reading, but I can already see where we’ll be in 5 years if someone (legal note: I'm not thinking of Mark Millar here) picks up on this possible financial revenue stream. Ugh. Ugh. And thrice ugh. But I believe Ponchione's intentions are honourable so I will say I have read the Blake Bell book on Ditko (Strange and Stranger: The World of Steve Ditko) and the Evanier book on Kirby (Kirby: King of Comics) and I can recommend them both. I particularly enjoyed the way Bell portrayed Ditko as not a mysterious, unfathomable freak but a human being; one who when young had a love of ping-pong and who made hand-made Christmas cards for his colleagues. Mark Evanier, predictably enough, continues to be the Boswell Kirby deserves. No faint praise that. I haven’t read the Bhob Stewart book on Wood (Against The Grain) but I understand Fantagraphics is reissuing it in a rejigged form this year (2015) so I will then. I haven’t read it yet because at the time I couldn’t afford it and plumped for a cheaper unillustrated option (Wally's World by Starger & Spurlock). It was okay, but it suffered unduly in that it was the first time I’d read a book about a comics creator. I just suddenly had a yen to know about the people who made all this wonderful stuff. I thought I’d start with Wallace Wood because whenever I saw the level of genius in his art I couldn’t help thinking, “Boy, I bet that guy died rich and happy!” Yeah, hoo, I was surprised. Hilariously I soldiered on and my next foray into the chucklesome real world of Comic Creators was Art Spigelman’s book on Jack Cole (Plastic Man & Jack Cole: Forms Stretched To Their Limits). “Surely”, I thought having learned nothing, “Surely, this guy died rich and happy!” Yeah. Oof. When Jack Kirby famously said that comics would break your heart, I didn’t realise he was being upbeat. No wonder Steve Ditko prefers to keep schtumm. Those guys were/are Great but DKW was GOOD! One died badly, one died battling for recognition and one turned his back on us - Hey, Kids! COMICS!!! Stay up to date with our Instagram feed!